The Royal Palm Beach Hotel is located just 35 m from the beach and Gumbet Bay in the lively Aegean resort of Gumbet on the popular Turkish Riviera. Only 3 km from Bodrum Town, this modern 4 Star seaside hotel is perfect for couples and families looking for an elegant and affordable base from which to explore all the wonders of this exciting part of the world. A total of 86 luxurious guestrooms offer comfortable furnishings and modern amenities. Guests to the Royal Palm Beach Hotel can play water sports on the beach, walk less than 5 minutes (400 m) to Gumbet Centre with plenty of restaurants, bars and cafes, explore delightful villages, and experience real Turkish hospitality. 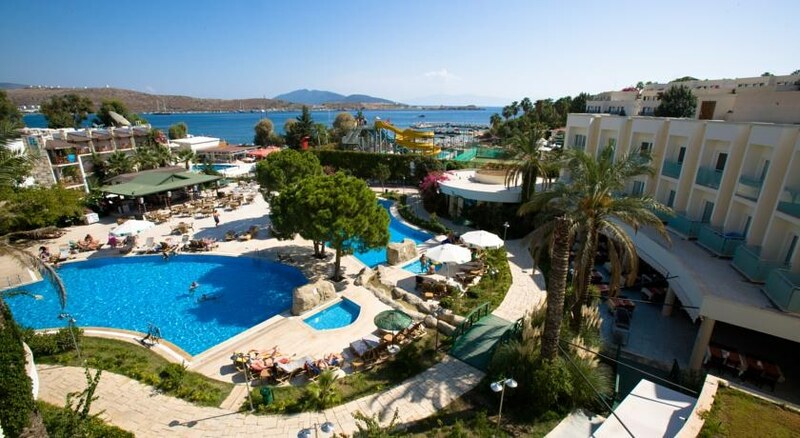 Getting to the Hotel: Bodrum Airport is 35 km from the Hotel easily accessed via Gumbet- Bodrum inner city minibuses from Bodrum intercity bus station. Local Tips: Gumbet is a purpose-built resort geared towards younger holidaymakers, couples and families and is best suited to those who prefer beaches by day and bars and clubs by night. Please note: Rates and conditions are only valid for UK residents. Food, drink and entertainment: All Inclusive accommodation. Breakfast, lunch and dinner are served in the main open/indoor restaurant with open buffet service. There is a restaurant bar, and pool bar. The Garden Beach Restaurant also offers complementary sunbeds, cushions and umbrellas at the beach. Evening entertainment includes various night shows. Sports, games and activities: Two outdoor swimming pools, sun terrace with sun beds and umbrellas, garden, 2 children's pools, fitness centre, Sauna, table tennis, Billiards, game centre, animation team offering various games and activities. Sunbeds, cushions, umbrellas, as well as food and drinks are available on the beach with charge. Activities with charge include banana, parasailing, and jetski. Additional: 24 hour reception, room service, free Wi-Fi Internet access in the lobby, doctor on call, laundry and dry cleaning service, fax and phone services, safe (with charge), market, meeting and conference rooms with business equipment. Honeymoon added value with free bottle of wine in room and fruit basket. The Royal Palm Beach Hotel features 86 double, triple and quad rooms (standard rooms can be booked for single use). All rooms have a bathroom (shower, WC, hair dryer), safe (extra charge payable locally), 220 V electricity, mini bar, Satellite television, split air conditioning, telephone, and balcony. 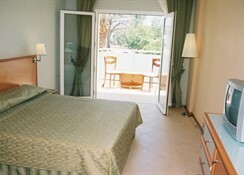 The rooms have double or twin beds, with towel and bed lining replacement twice a week, as well as daily room cleaning. Free baby cot on request.